Q: What is 'Love in the Afternoon' about? Q: Why did they go to jail in the end? The first time you taste brie, or even champagne, you may not like it. It isn't what you are used to; it isn't what you expect. You educate your palette, and, eventually, you learn to appreciate not just good wine or good cheese, but the very best. "Love in the Afternoon" is one of the very best films ever made. As comments here reveal, though, uneducated viewers may not appreciate it. It is problematic, primarily, in that Gary Cooper, obviously in his late fifties here, is cast opposite a dewy Audrey Hepburn. The eyeballs of the average viewer are offended, and they want to turn away. Too, the movie, like a great lover, takes its time to achieve its delicious effects. Viewers trained on the rapid-fire vapidity of TV sitcoms can't sit through this movie. 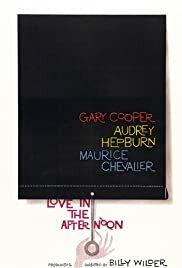 Connoisseurs, though, will watch "Love in the Afternoon" again and again, and find new aspects of it to love every time. First, yes, Gary Cooper *is* old here. His eyes are baggy, his hair is receding, and Wilder does his best to camouflage this by shooting Cooper in shadow, or even in reflection. In one scene he is talking to Hepburn, and we see her, but see him only in his reflection in the surface behind Hepburn. I wonder if this was at all humiliating to Cooper, who was, in his prime, one of the most beautiful -- not just handsome, but truly *beautiful,* with his long eyelashes and lush lips -- men on earth. Too, Cooper did always tend to be more of a reactor than an actor, best cast against live wires like Barbara Stanwyk in "Meet John Doe" and Jean Arthur in "Mr. Deeds Goes to Town." It is hard to believe that he would be able to sweep women off their feet. Cary Grant would have been more believable. But, do Cooper's "flaws" weaken the film, or, rather, strengthen it? Cary Grant could have been simply too brutal in this part. He was still astounding looking, and he did have an irresistable allure. Had Grant, not Cooper, mouthed Frank Flanagan's callous line, "I believe we should all act as if we are between planes. No connections. No complications," Had Grant, not Cooper, callously dismissed the woman who attempted suicide over him, Grant might have sounded like Mack the Knife. Coop, on the other hand, as an aging, inept Lothario, says these lines with a real poignancy. That "Time's Winged Chariot" can no longer be kept at bay in his life, that Cooper so clearly shows what such a life does to a man's face, and maybe his soul, makes Cooper poignant as well as powerful here. Unlike Grant, Cooper's face did show the wear and tear of his highly glamorous life. No "Dorian Gray" he. Audrey Hepburn / Ariane's love for obviously aging Cooper/Flanagan becomes not just her powerless surrender to his machine-perfect seduction, complete with his own Gypsy orchestra, but also her *empowered* rescue of him. Hepburn's empowered Ariane shows Cooper's Flanagan real love before it is too late for him ever to experience it. Cary Grant would not have been able to carry off this aspect of the movie as is, and Hepburn would not have achieved the stature opposite Grant that she does achieve opposite Cooper. Now, as for the movie's pace. Wilder is a craftsmen and real movie lovers will drool over every frame of every scene. Wilder delivers sight gags, throwaway lines, fully developed secondary characters. I've seen this movie perhaps a dozen times and every time I see it I see something new, it is that rich, that packed with evidence of Wilder's craftsmanship, and his determination to produce a worthy tribute to his own master, Ernest Lubitsch. Wilder is wildly successful. Tiny bits reward me for returning to this movie. Maurice Chevalier's hand gestures. The black and white cinematography of Paris. The lovers who kiss through street sweepers. "The Gypsies," as they are listed in the title credits. The moment when one Gypsy stands out from his orchestra and steps forward, sensing a heightening of romance, and begins to play from his very soul. Watch his face. It says so much. How many times has he stepped forward like that during one of Flanagan's seductions? And yet he, no less than Flanagan's latest lover, is fully in thrall to the True Romance of the moment. And, and ... Audrey Hepburn. She is a goddess here, no more, no less. Gamine like, and radiating the wisdom of the ages. I don't think Hepburn shines any brighter, or hotter, in any other movie, and, again, it is exactly Cooper's obviously ravagement by time that makes Hepburn so strong here. This movie is funny. It is romantic. It is a salute by one master filmmaker to another. It is a rich display of craftsmanship. It is one of the very best. I'm grateful to Wilder for "Love in the Afternoon."